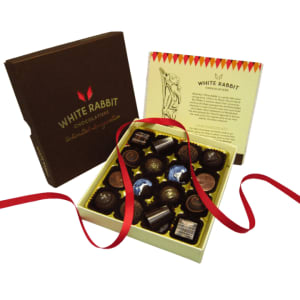 The White Rabbit Chocolate Company love the exotic balance of flavours in this multi-award-winning slab. Their 70% dark chocolate is blended with the essence of blood oranges and ground all-spice berries, then scattered with juicy cranberries. Delivery to your door, across Mainland UK, for only £4.99. Order before 9.30am Monday to Thursday and your order will be dispatched the same day by courier or Royal Mail for next day delivery. Orders made on Friday, Saturday, Sunday will be dispatched on the following Monday. There is a minimum order of £10. A chocolate wonderland from an historic Yorkshire market town. Sally Hawkes and son Edward, shape dreams for every chocoholic, mouth-watering handmade tasty delights. 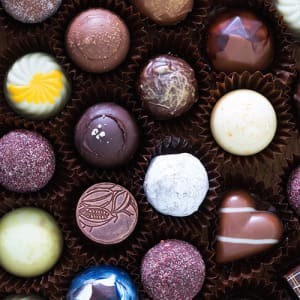 Their version of chocolate heaven has earned them over 16 Great Taste Awards and a Golden Fork Nomination. 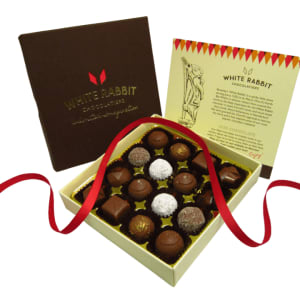 Welcome to the wonderful world of White Rabbit Chocolatiers.